This chicken and rice casserole will surely hit your comfort button, especially when you’re having a less-than-amazing day. You can simply ease your worries about how your dinner should be, and instead, just enjoy a book or Ellen’s while on the wait. And by messy, I mean really, really messy. This chicken and rice casserole is like a complex but nice and warm combination. 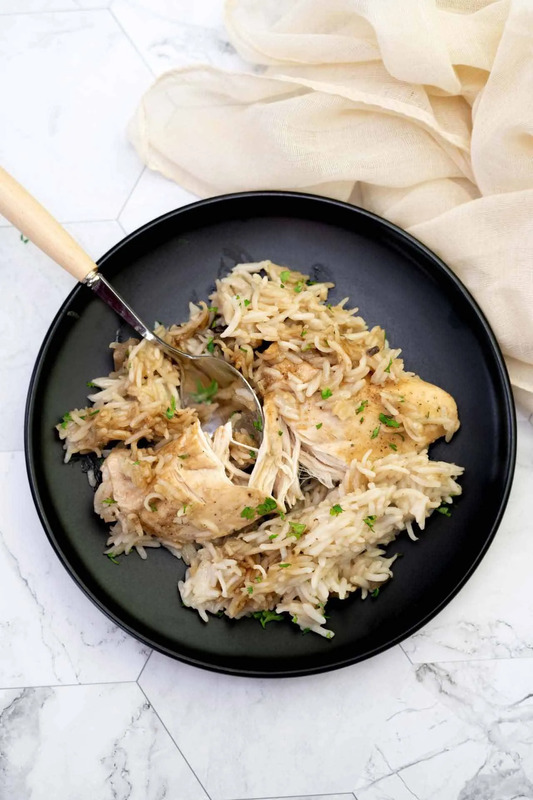 Look, it’s one-pot, and things are coalested so well into each other in layers – the tender juicy chicken meat, the chewy long-grain rice, the savory and earthy taste of mushroom and onion soup. It’s a brilliant pleaser that will have your back whenever you’re too wagged out to actually put your mind to anything. It’s really just that oldschool-crowd-fed-casserole type of goodness. Right from the beginning, from its pallid looks, you can easily see how this dish is not quite in the same category as other fancier meals. However, the best thing about it is the pleasant nostalgic feeling which is reminiscent of when I was a kiddo, waiting on the pantry on rainy days and trying to figure out what secret my momma was about to serve each night. What to cook with chicken and rice casserole? Chicken and rice casserole can be prepared in no time with only a few ingredients: chicken breast meat, white rice, and onion & mushroom soup powders. Chicken strips are assembled in the baking dish, layered with basmati rice and then cooked together in the oven with mushroom soup and onion soup mix poured on top. If you’re planning on feeding more greens to your toddlers, simply toss in some veggie chunks for extra crunchiness. Rotisserie chicken might also be a contender for the dish – though you really don’t have to go that far, since everything will surely be cooked through properly when baked. Additionally, an extra Chipotle seasoning could be something to consider. How long to bake chicken and rice casserole? This chicken and rice casserole took me roughly 1 hour and 40 minutes to prepare. Though the cooking time can vary in other recipes with different ingredients, you can’t realistically expect to spend less than 1 hour on this dish. The chicken meat simply needs an adequate time to absorb all the liquid and be cooked through to the proper tenderness, and the same goes for the rice. Trust me, you’ll see that it’s worth the wait once it comes to your table. While the oven’s doing its thing, go start up Netflix and just relax! Don’t forget to turn the air conditioner on; you’ll be sweating just by chewing and getting lost in the casserole soon enough! Can you freeze leftover chicken and rice casserole? Yes, you can – even with big batches. Chicken and rice casserole can freeze well for up to 3 months. It’s freezer-friendly and can be reheated in minutes, so you’ll easily have a hearty lunch ready on the following day. You can also make 2-3 servings for both a friend’s visit the next day and family dinner tonight; otherwise, divide it into smaller portions so you can consume it in one go each time without having to bother transferring it to smaller plates, which means more dishes to wash.
It’s also important to let the casserole cool down to room temperature first, then cover with tin foil before putting to freeze. Season your chicken breast with salt and pepper. Spray your baking dish with cooking spray. Add the chicken meat, then a layer of uncooked rice to cover the chicken. Pour the onion soup mix onto the rice, then follows with the mushroom soup and 1 1/2 cups of water. Cover the dish in a baking sheet and bake in 1 hour and 30 minutes. Remove the casserole from the oven, serve while it’s still hot. Chicken and rice casserole can be served by itself or with whole wheat rolls, sometimes can even be scooped out and mixed with veggies to form a hearty salad. The dish appeared a bit too salty for me the first time I tried, so I cut down on the amount of mushroom soup the second time round. If it somehow tastes too briny or too bland for you, my advice would be to adjust the volume of soup or soup mix that is going into your dish. I think chicken and rice dishes are some of the most comforting out there. This one sounds super tasty too!